Last week was Bo et Obi's open school week. As usual, parents are invited to come to school and observe the kids at their class for one hour. Udi and I certainly don't wanna miss it :). So last Wednesday we went to Obi's class to join others in this ocassion. They were drawing Thanksgiving-related items and coloring them. 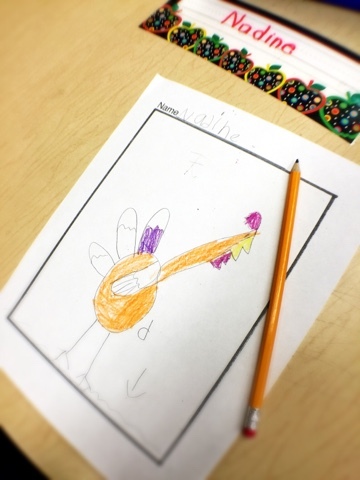 And Obi chose to draw her purple-and-orange turkey. 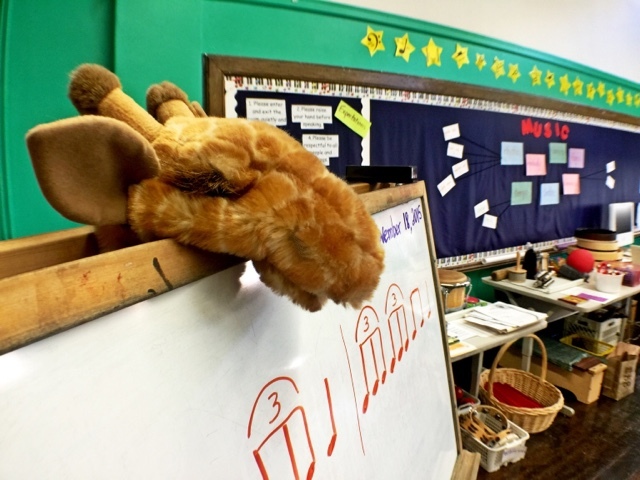 In Obi's music class, the kids learned a new song. I forget to ask the title >_< but it's about the hunter walking in the forrest and shooting his arrow to the air. 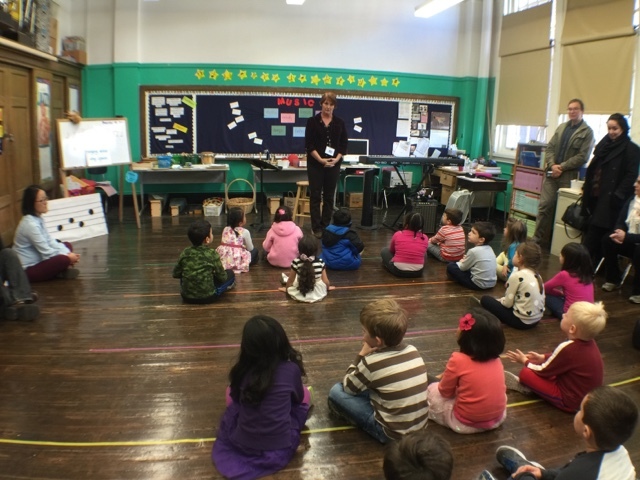 Mrs. Robinson, the music teacher, mimed it and the kids try to guess what is in the lyrics. We got to meet Lulu as well, the singing giraffe in the class :). It was fun for the kids indeed. And also us, the parents :). On Friday, it was Bo's turn. As for Bo's class, they were working on the latest chapter on their social studies book, about the lives of native Americans. 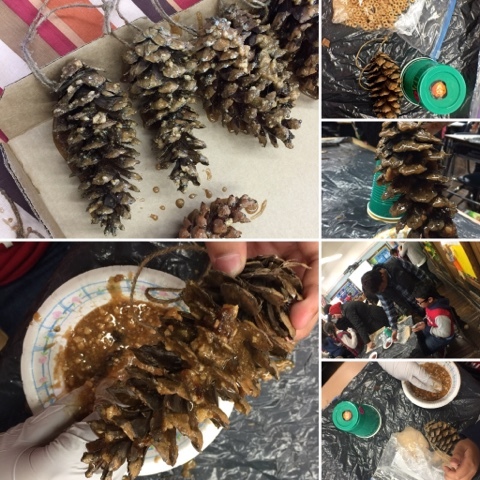 They were making the traditional bird feeder inspired by the native Americans by using cheerios, pancake/maple syrup, and pine cone. The picture above is what Bo and his friends made at school that morning. Simple yet very interesting indeed. Bird feeder, the American natives way. tighting the rope at the bottom of the pine cone. 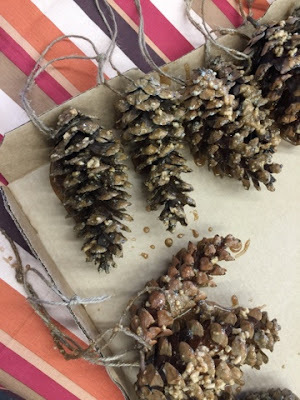 Set it aside then mix the crumbs and syrup, then spread it all over the pine cone :). And voilaaa... The bird feeder is ready. How the kids enjoy this session with their parents. Pounding the tables while crushing the cheerios, mixing the look-oh-so-disguisting gooey syrup with the crumbs, then dipping the pine cone to it... Let alone the messy tables, which, fortunately have been covered by plastic garbage bag. Once the bird feeders where well dried and ready, they put and hang them on the trees outside on the following Monday. The day before the teacher has sent a permission slip noting whether the kids have any allergies to the ingredients being used as well permission for taping of video of photography for the school documentations. During the open school week, we also have the book fair and Bo managed to get Captain Underpantz comic while Obi got her super Barbie one. Well, it was quite a fun week for the kids and the parents indeed. 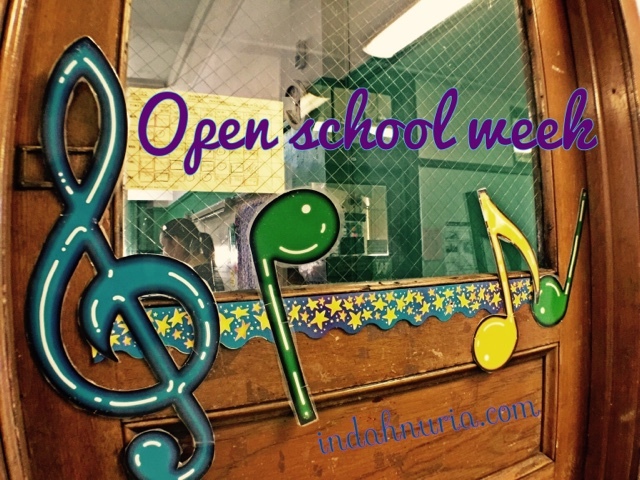 Do you have open school week as well at your kid's school? What activities that you enjoy most during that week? I miss open house days at the school. Now that the girls are older, they don't do that anymore. Sounds like you had fun at the school though! That does look like fun! I love the pine cone project. My kids have an open house, but it's in the evenings. If looks like you guys had a lot of fun. That such a great shot of the door at the beginning of the post.